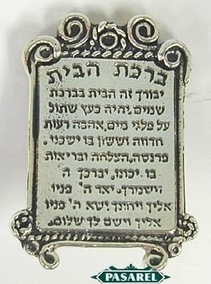 Sterling silver house blessing miniature This fabulous house blessing miniature is inscribed in the center with the Jewish house blessing in Hebrew. Measurements: Height: 2in. / 5.08cm. Width: 1.3in. / 3.302cm. Thickness: 0.8in. / 2.032cm. Weight: 11.9gr. / 0.383oz. Marks: 925 for sterling silver.